A 25-year-old female, known case of cardiac atrial septal defect, presented with sudden painless diminution of vision in OS for past 3 days following transesophageal echocardiography. OD was normal. OS best-corrected visual acuity (BCVA) was 20/400 with normal anterior segment. 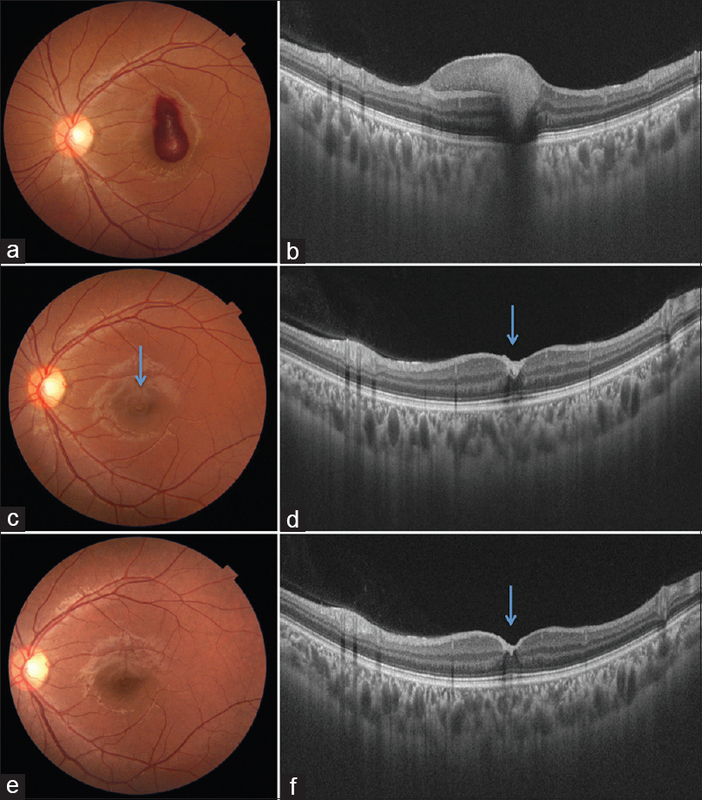 Fundus [Figure 1]a and swept-source optical coherence tomography [SSOCT, [Figure 1]b showed premacular hemorrhage. Patient was diagnosed as OS Valsalva retinopathy following transesophageal echocardiography and kept on close follow-up. At 6 weeks, BCVA OS improved to 20/60. Premacular hemorrhage decreased in size [arrow, [Figure 1]c]. Small area of hyper-reflectivity was persisting on SSOCT [arrow, [Figure 1]d]. At 6 months, BCVA improved to 20/25. The hemorrhage resolved clinically [Figure 1]e. The patient reported metamorphopsia that could be attributed to internal limiting membrane thickening visible on SSOCT [Figure 1]f. In view of good visual acuity, the patient was not keen for surgical intervention. A transesophageal echocardiogram (TEE) involves passage of a specialized probe with ultrasound transducer at its tip into the esophagus to obtain an echocardiogram. Valsalva maneuver is done with TEE to detect patent foramen ovale and TEE (or other endoscopic procedures like bronchoscopy) may itself produce Valsalva-like stress. Therefore, the treating physician should be aware of possibility of Valsalva retinopathy following TEE and should also counsel the patient accordingly. Most premacular hemorrhages tend to get absorbed spontaneously within 2–4 months. An Nd-YAG laser membranotomy may be performed in fresh cases (it disperses the contained blood in to the vitreous cavity), which clears visual axis., Nonresolving premacular hemorrhages may require vitrectomy. To conclude, TEE can lead to Valsalva retinopathy and should be explained to the patients in preoperative counseling as a cause of visual decline. Though premacular haemorrhage may resolve spontaneously, patient may have residual visual disturbances. Rodrigues AC, Picard MH, Carbone A, Arruda AL, Flores T, Klohn J, et al. Importance of adequately performed Valsalva maneouvre to detect patent foramen ovale during transesophageal echocardiography. J Am Soc Echocardiogr 2013;26:1337-43. Raymond LA. Neodymium: YAG laser treatment for hemorrhages under the internal limiting membrane and posterior hyaloid face in the macula. Ophthalmology 1995;102:406-11. Shukla D, Naresh KB, Kim R. Optical coherence tomography findings in Valsalva retinopathy. Am J Ophthalmol 2005;140:134-6.